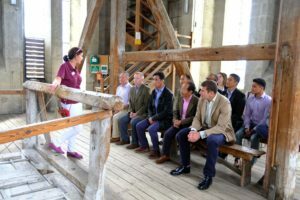 On 15th June 2017, 13 members from Headquarters Brigade of Gurkhas visited Salisbury Cathedral for a team building event. Salisbury Cathedral, formally known as the Cathedral Church of the Blessed Virgin Mary, is an Anglican cathedral in Salisbury, England, and one of the leading examples of Early English architecture. Over 750 years old, Salisbury Cathedral is located in Salisbury Wiltshire. It is a truly remarkable building, a testimony to the faith and practical skills of the medieval craftsmen who built it, but it is much more than a historical monument. We learned much from the visit and interesting facts about the Cathedral. These facts included; the Cathedral has the tallest church spire in the United Kingdom, at 404 feet (123m). It contains the world’s oldest working clock (from AD 1386) and has the best surviving of the four original copies of Manga Carta. The Magna Carta (Latin for “Great Charter”) is one of the most celebrated documents in English history. At the time it was the solution to a political crisis in Medieval England but its importance has endured as it has become recognised as a cornerstone of liberty influencing much of the civilized world. The visit to the Cathedral was followed by something completely different but did involve the team gaining some height. 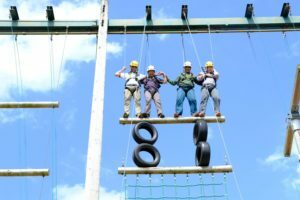 We moved the Army Training Regiment at Winchester and got to tackle their high ropes facility. It was definitely a nerve wracking experience, as the team had to go through menacing rows of obstacles to complete the activity. A good team cohesion and communication is vital in successfully executing any such activity, which undoubtedly was seen in our attempt at the high ropes. The team building day was very productive and all the staff got involved and enjoyed the activities. We had such a great opportunity to explore a part of the ancient history of England. We also had chance to work as a team outside the usual office environment. The Headquarters Brigade of Gurkhas staff are now looking forward to the next team building day and the experiences that will bring.